We’re fans of packaging, and we’re fans of food. So, being fans of food packaging seems like a no-brainer, doesn’t it? After all, lots of it is good-looking, well-constructed, and protects everyone’s favourite thing—food! And while food packaging is a booming business (like so many others), only a few examples truly rise to the top. We like to call those iconic packaging, and this time, we’re checking out the Heinz Ketchup Bottle. Henry Heinz started his business selling freshly-grated horseradish, using clear bottles to prove the product was fresh for consumption. Eventually branching into other condiments, Heinz began creating tomato ketchup, creating one of the most iconic packaging pieces out there. 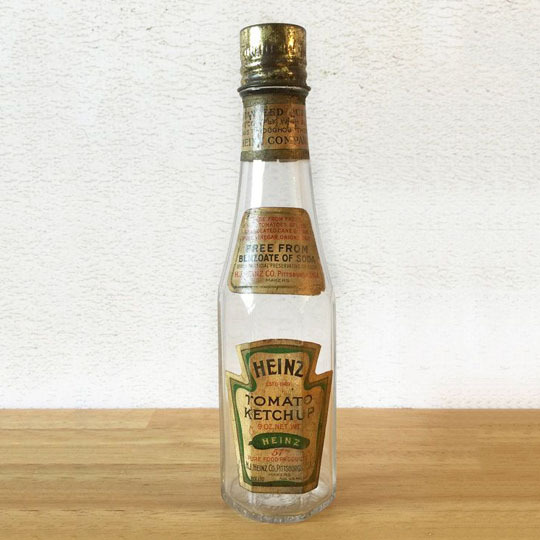 First released in 1876 in a keystone-shaped bottle, Heinz’s dedication to freshness and purity in his ketchup lead to him finding new and better ways to bottle and protect it. The octagonal-shape bottle enters the market, designed with multiple advantages over other condiment bottles. Being unique in appearance, it near-instantly takes over customer perception of what a ketchup bottle should look like. The curved neck encourages the ketchup to flow out smoothly, while the narrow mouth minimizes the amount of ketchup exposed to air (preventing it from turning brown). Talk about iconic packaging. The Keg O’ Ketchup debuts on store shelves, capitalizing on greater market demand for ketchup. Holding 32 ounces, it’s one of the biggest condiment containers available in grocery stores, and is perfect for big families. Though production ceases in the late 70s, the giant bottle remains a sought-after prize for collectors. Made of bendable plastic, the squeezable bottle is released and instantly hailed as an innovation. No longer do ketchup lovers have to wait for their favourite condiment to dispense itself, they can eagerly get down to squeezing out as much as they want. 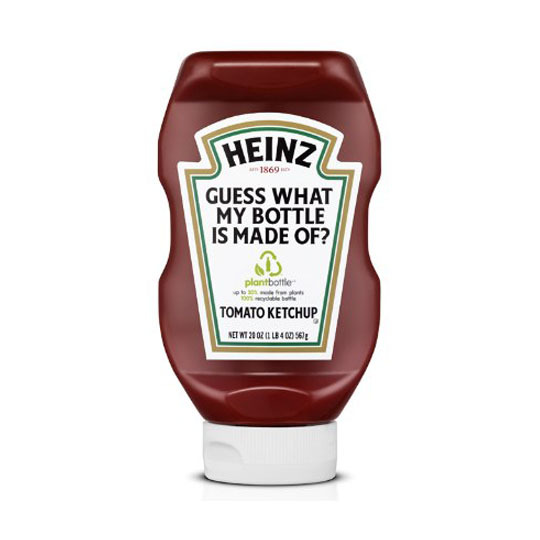 The squeezable bottles become so popular that Heinz eventually stops production of their glass bottle—until 2011, when they release a limited-edition bottle, complete with a version of their original label. 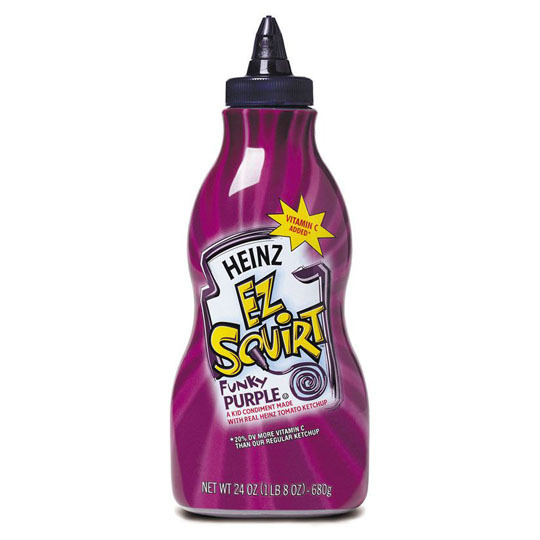 In an effort to appeal to kids, Heinz introduces the EZ Squirt bottle. As its name implies, it’s easier for little hands to squeeze, giving them a sense of independence. The dispensing cap also helps reduce excess mess, appeasing worried parents. Introduced in a green colour, it’s a huge hit with kids, and eventually becomes available in other colours like blue and purple. 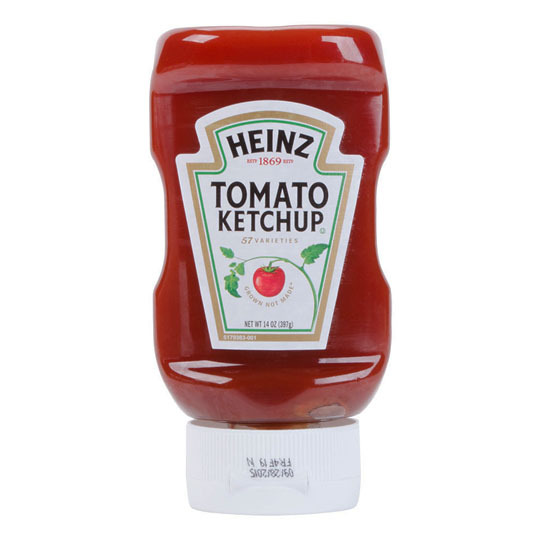 The upside-down bottle is made for even easier dispensing of ketchup, using the plastic bottle design and gravity itself to aid in the squeezing motion. Sitting on its cap, the ketchup stays in contact with the closed opening, keeping air from spoiling it. Customers so enthusiastically embrace the packaging that other condiments (and even other competitors) now use the design. 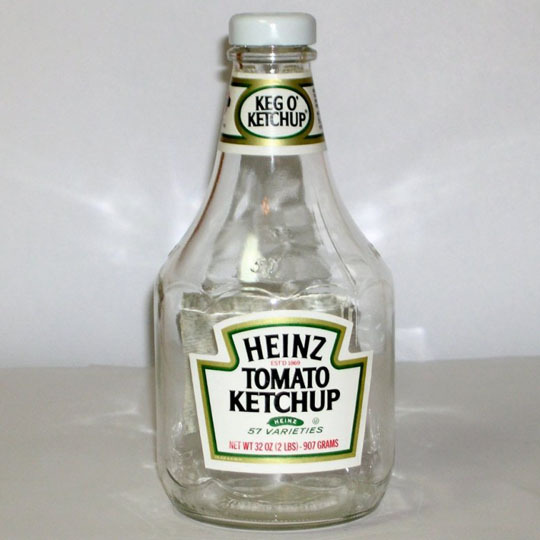 As part of the global effort to go green, Heinz releases the PlantBottle design for their condiment line-up. Made from up to 30% renewable plant material, it creates less of an impact on the environment and is still 100% recyclable. 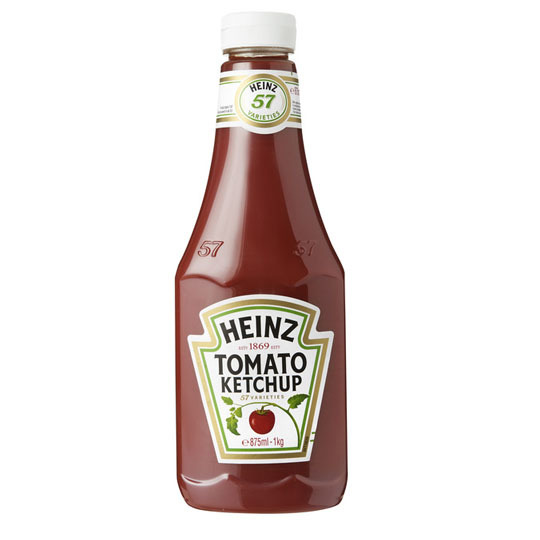 Heinz sells over 650 million bottles a year, across a number of condiments and bottle types. And though the bottle shape has been refined and adapted over the years, it still adheres to one intention: the easy, smooth flow of tomato ketchup. What packaging design do you think is worthy of the iconic packaging title? We’d love to hear from you.